Jan Brockhoff (AWT-Greenway) powered to the victory in a short opener of 7th Carpathian Couriers Race. 20-year-old rider clocked a time of 2:08 on a 1.8km prologue, beating Estonian Silver Mäoma and Dutchman Tim Ariesen (Cyclingteam Jo Piels) by less than a second. „I was feeling good. I went well in the corners but I wasn’t expecting to finish first and win. With prologues, you never know. It’s all very close, within one second. I’m really satisfied” – Brockhoff said after the finish. Rider from Germany has never raced Carpathian Couriers Race before and was more than happy to receive the leader’s jersey and a small statue from salt mines of Bochnia. With Erik Baska looking for stage wins and riders like Maximilian Schachmann on a roster, AWT Greenway is looking to defend the jersey, although, as Brockhoff admits, it is just the begining and retaining the jersey is a very difficult task. Carpathian Couriers Race is the biggest stage event for espoirs in Central and Eastern Europe. 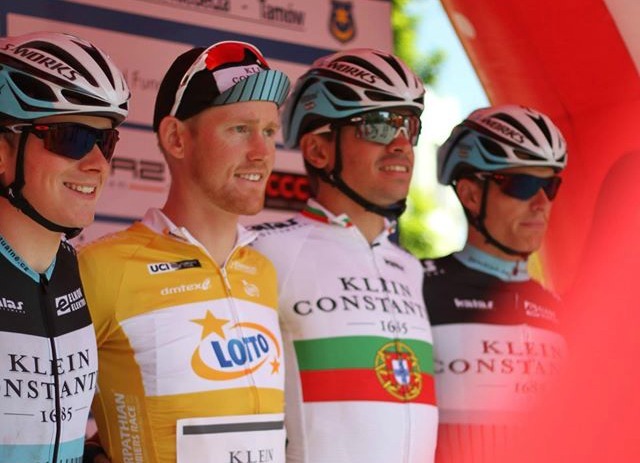 This year five difficult stages await for the peloton of the 136 young riders, as the race makes it way to the south, tackling the climbs of Carpathes on the border of Poland Slovakia. „The race is impossible to control. There are almost 30 teams, 5 riders each. If you have the leader, you have only 4 guys to do the job. So it’s a really hard thing to do. It’s also about luck, there will be lots of breakaways and attacks” – Brockhoff said. Estonian rider Silver Mäoma, who finished only 0.19 seconds behind the victorious German, was happy with the result. Only 19, racing for a French club in Saint-Etienne, he is now 2nd in the general classification but remains realistic about his chances. „Next two stages are too hilly for me but I will try to go for the win in next days. I’m more of a sprinter” – he explained.